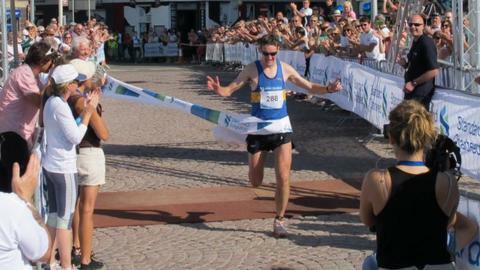 Scotland's Jethro Lennox has ruled himself out of Sunday's Jersey marathon because of injury. The 2011 winner will not be amongst the record numbers taking on the course but has instead agreed to travel to the island to be a marshal. Last year's women's winner Shona Crombie-Hicks has entered the event and will defend her title. She smashed the course record a year ago, finishing the race in two hours 53 minutes and 36 seconds. BBC Radio Jersey pundit Dave Woodsford thinks that time and the men's record are both under threat. "It's the best field you've ever had," he said. "Crombie-Hicks didn't have competition last time but has it this time." Among the favourites in the men's race is Manchester runner Thomas Abyu who is aiming to finish in two hours 16 minutes. That would thrash the record of two hours 29 minutes and five seconds set by Andrew Hennessy in 2008. The number of entries this year has been boosted by police officers from the UK. Every year, the police have an inter-force competition within an established marathon and were persuaded by Jersey's police chief Mike Bowron to come to the island this time.